This weekend the British & Irish Indoor Tug of War Championships was held at Piperdam. 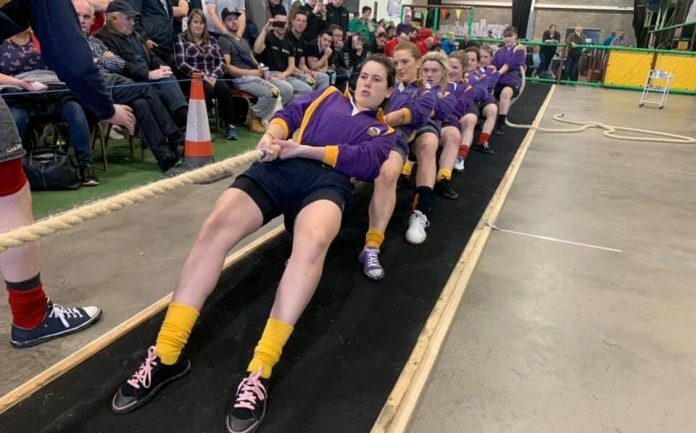 It was a well attended event with many men’s teams competing but unfortunately there are very few women in the UK & Ireland involved in indoor tug of war with only 1 girl from England, 1 girl from Northern Ireland and 1 girl from Ireland making the trip to Scotland. Luckily Scotland had a strong squad of 12 girls attending the championship, to ensure all the girls got pulling there were 2 girls teams of 7-aside made up. It was a competitive battle between Cornhill and Ayrshire with Cornhill taking the win 2-1 in the final. The Scottish girls were out in action again during the 580 kg mixed competition. There were 3 Scottish mixed teams competing in this event Cornhill, Ayrshire and Tinto. After close league matches it was Cornhill and Ayrshire that made it to the final with Cornhill taking gold with a 2-1 win. These 3 mixed teams did battle again in the 560 kg mixed competition this time the final featured Tinto and Ayrshire. Tinto took home the gold with a 2-0 win in the final. It was a great championship and, despite the few girls attending the competition, there were still many competitive battles in the ladies and mixed weights. 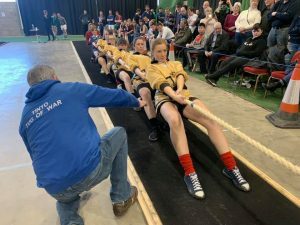 If you fancy giving Indoor or Outdoor tug of war a go then check out the Scottish Tug of War Association website to find your nearest club.